It has been a really busy few weeks. But summer is here and the snowbirds are leaving. That usually means things slow down. So, I was just going to write a happy mom’s day to all you mom’s out there, but didn’t even find time to do that. I’m back at it, but a little pushed for time, so this will be short. Although I bought that really good book about fabric beads, there are just some things you have to learn by trial and error. So, if you’ve taken an interest in this subject, hang in there. One tip I’d give is that you must be very careful when rolling the beads to get the ends perfectly even, or you’ll be trimming them–a big time waster. Also, you’re gonna find that some fabrics just don’t roll well, so stick with silk, cotton, linen and leather. Sometimes polyester will work, but you’ll probably have to reglue them at the edges. Which reminds me, use only enough glue to coat the fabric strip. If it bleeds thru, it will leave dark places. As will getting it anywhere on the front side as you work, so keep a wet cloth handy to wipe your hands and a dry towel to dry them. I finally received the bail I’d ordered from Art Beads and made the necklace I showed the beads for. I will photograph it once I get earrings made and post it for all to see. Unfortunately or not, I need several projects going at once to be happy, so the earrings are not done yet. But I have comitted to competing everything I have going before I start anything new. If you’re delving into this adventure with fabric, good luck and enjoy the journey. 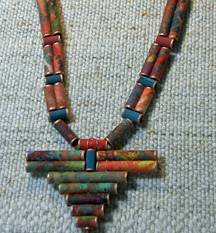 The simplist way to see what to do with fabric beads is to see some photos of jewelry. I am always pushing the envelope to make it more interesting and exciting. Also, it is good to know beading basics so you don’t spend time taking apart and remaking jewelry. I have a habit of just jumping into the pond and learning how to swim later. This time I actually bought some books to help out, and later I found a friend who taught me alot. 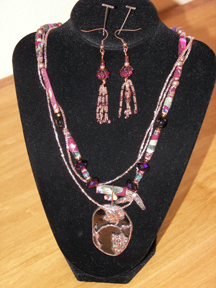 But before I really knew what I was doing, I purchased findings that are too inexpensive to put on my jewelry. I know better now, but it did give me the opportunity to sell some things and make some money to buy better quality stuff. I also went to a bead show and bought some stuff that wasn’t of good quality. Now I know better. There’s one coming up in June in Las Vegas, and this time, I’ll be a more educated consumer. Saves money. So, I’m going to post a few pictures to give you some ideas. You can ask any questions you like and I’ll be happy to help you solve any problems that I can. I had another photo for you to view, but wordpress and I can’t agree to insert it. Got it and it was my fault. Sometimes the gremlins attack! As you can see, both types of fabric beads have been used. When it is simple stringing, it is important to put gemstones, pearls, wood beads — some type of bead to help stabilize the fabric beads. Have fun and let the adventure begin. I just finished a blog and lost it. How on earth does that happen. Anyway it was about actually making the beads now that you have some fabric decided on. I make two types of beads: tubes and ovals. Use a rotary cutter on a mat for the most consistant beads. You’ll also need a 18″ plastic ruler–the type used to cut fabric for quilts. You will cut your fabric lengths with consideration for the thickness of the fabric and the diameter of the straw. Here are the basics, but you’ll have to do a little experimenting to see what works for you: thin coffee stirrers, cut strips in 11/2″-2″ lengths; regular straws, cut fabric strips in 3″ lengths; jumbo straws, cut fabric strips in 5″-6″ lengths. These lengths make for good, sturdy beads. Remeber to cut with the grain of the fabric. Tringles start with rectangles. The width of the bead ranges from 1/2″ to 2″. I like the shorter beads best as they lay nicest. Once you have your rectangle, place the ruler about 1/2″ up the bead and diagonally between the edge and the center of the bead. Do the same on the other side. You will generally roll these on the coffee stirrers. Prepare a drying rack. You can use chopsticks with a rubber band wrapped around several times and stuck into a container with dry beans in it, or toothpicks stuck into packing foam blocks. That is my preferance. For gluing you will need your fabric strips, straws, Weldbond glue, spatula (small), and newsprint or newspaper. I also keep a wet rag hand for wiping hands. You don’t want glue on the exterior of the bead as it leaves a smudge. Pleace the fabric face side down on the paper, add a bit of glue at the top and fold it over the straw. Add glue to the rest of the fabric, smooth with the spatula, and roll around the straw. Voila, your first bead. Place it on the drying rack and step away from the bead. Don’t futz with it or you chance ruining it. Beads must dry thoroughly befor they will release from the straw. 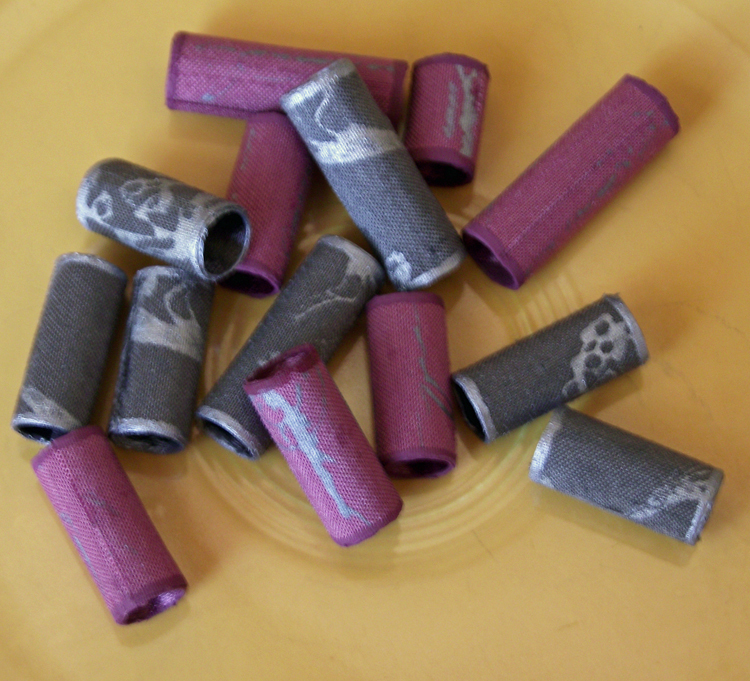 Now that you have some dry beads, take them off the straws, trim loose fibers and prepare to paint the ends. This ensures they will be solid. I love metallic acrylic paint for this, but do use acrylic craft paint as well. Shake the bottle well, then dip the ends into the cap where paint has settled. Do one end at a time and wait for it to dry before you do the other end. Your beads are now ready to string. What do you know about making jewelry? This is where the real adventure begins. I had to buy more books and find a beading buddy so that I wan’t reinventing the wheel. I must say that my supplies have grown with my knowledge. Can’t walk into a Joann’s or Michael’s without heading for the bead section, never mind a specialty bead store. And I’ve expanded the range of what I do. 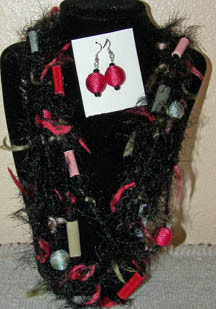 The following photo is an example of uisng fun fur and wrapped wooden beads. Let me know what you need instruction in and I’ll be glad to share what I know. 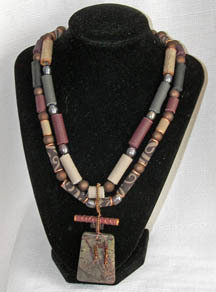 Just a quick note to show you a picture of some beads that I recently made for a great looking necklace. I thought you might be interested in seeing what they look like when embellished with a rubber stamp and metallic paint. Of course, I did the stamping before cutting the beads. In this case, I used a polyester fabric that is a little diffcult to work with, but has great colors. It’s really hard staying indoors right now as the weather is finally warm and the honeysuckle is in bloom. Come this weekend it will be hard to choose between going on an adventure and cleaning up the yard. This has been a very strange winter without good time to do winter clean-up, and now it looks as if it is going directly from cold to hot. When I say hot, I mean 100 degrees after highs of 55 degrees. Our snowbirds have already begun to leave town in droves, although where they are headed the weather is still awful. That’s why they head to Mesquite in the winter. It is tolerable here compared to where they come from. Even Mesquite is too cold for my liking, but how can I complain when it didn’t dip below freezing all winter. The fish in our pond barely had time to lower their metabolism before getting hungry and begging again. But it did give me some good time to express my creative nature, so staying inside isn’t so bad after all. Here’s the picture of beads that I promised. Let me know what you think of them and the technique. Next week I think I’ll give you directions on how to cut and roll the beads. Then you can begin to create on your own. Remember that very few people do this, so you can express yourself in a unique way and when I do shows, attendees love the things I make. I never worry about giving away trade secrets because whatever you do will be totally unique to you. I used text and lilly of the valley stamps. I’ve been a crafter all my life. When I married an artist I had no idea I could be one too. Turns out I am one. So, don’t think you aren’t one too. Art take many forms. Well, I guess I mean creativity takes many forms. And that leads to art. Creativity can be found in cooking, gardening, writing, drawing, painting, sewing, parenting–just about anything we do. I design interiors which led to making unique, fabric and textile jewelry and art objects. What an adventure. With my husband, I also create unique Southwest art objects we call Cliff Spirits. I’ll share lots of fun information with you about the process and the procedures and marketing and craft and art fairs. For now, I just want to say “Hi” to all you out there.